Cybercrime Investigation Department is the PUP that uses misleading techniques to prevent removal. Use Reimage to locate malicious components and get rid of them faster than with uninstall instructions. A full system scan blocks virus reappearance and prevents traffic to malicious domains. HOW CAN I GET INFECTED WITH CYBERCRIME INVESTIGATION DEPARTMENT VIRUS? HOW CAN I REMOVE CYBERCRIME INVESTIGATION DEPARTMENT VIRUS? Cybercrime Investigation Department virus is a ransomware that should never be taken as a legitimate warning got from the Cybercrime Department. This cyber threat is designed only to steal the money from unaware PC users, so stay away from paying the 'fine' for its invented crimes. It mostly claims that you have been illegally distributing copyrighted content, malware and doing other stuff and now you have to pay the fine through Ukash or other prepayment system. We recommend to ignore this request because none of the reputable institutions pick their fines in such way. However, one of its mostly annoying features, which can't be ignored, is its capability to lock the system down and disable user from doing anything there. 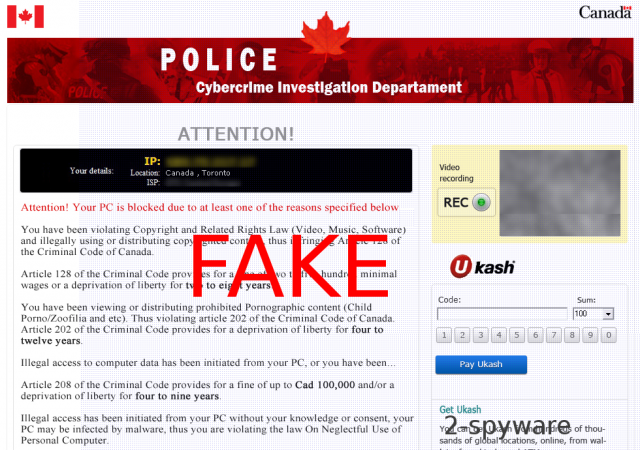 According to the latest reports, this Cybercrime Investigation Department virus attacks Canadian users. It typically relies on security vulnerabilities and uses trojans for its attack that usually stays undetected. As soon as it gets there, it displays its legitimately-looking alert which claims that user's PC has been blocked due to 'violating Copyright and Related Rights Law (Video, Music, Software) and illegally using or distributing copyrighted content, thus infringing Article 128 of the Criminal Code of Canada'. Finally, it shows the Ukash payment system window asking to pay the fine. Instead of falling for this sneaky ransomware, we recommend to ignore Cybercrime Investigation Department alert and remove this annoying cyber threat because it's a true scam that seeks to get some money from you. Besides, it may also steal your credit card details and use them for the future crimes. Take another computer and download Reimage, Malwarebytes MalwarebytesCombo Cleaner or other reputable anti-malware program with it. Update the program and put it into your USB drive or simply burn a CD disk. While the CD burns or USB drive get's the information, reboot your infected machine to Safe Mode with Command Prompt (by pressing F8 on boot) and then stick the prepared USB drive or put the CD disk in it. Reboot the infected computer once more and run a full system scan with the program you downloaded. This entry was posted on 2012-08-20 at 03:28 and is filed under Ransomware, Viruses. You can quickly scan the QR code with your mobile device and have Cybercrime Investigation Department virus manual removal instructions right in your pocket. How did you remove Cybercrime Investigation Department virus?